Hey everybody, it's Truffles! This would appear to be Dog Week here on Mochas, Mysteries and More. We didn't plan it that way, but today I'm interviewing a fictional canine, tomorrow I'll be interviewing a very special, courageous real-life woofie, and later this week Mommy will be writing about one of her favorite dog bloggers and reviewing a book with a dog-twist! Hope you'll stop by each day, and make sure you leave a comment below because I have an ebook copy of Sketcher in the Rye to give away! Welcome, Hobo! Can you tell us about how you came to live with Rory? Hi Truffles! Well, it was all very upsetting really. One day a bad person came into our house and killed my mommy. I was so sad and afraid. Too many animals are treated like second class citizens. But then Rory came and took me home and loved me. I'm soooo grateful. I can't believe how lucky I am. 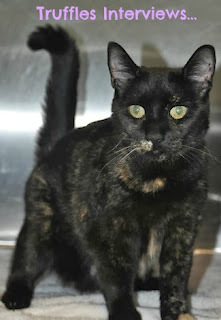 When my first mommy found me, she named me Hobo, because I was poor and homeless just like a Hobo. You live with the ghost of an Old West marshal. How did you get used to that and what is your relationship like now? That was terrible in the beginning! I'd never met a ghost before. He was there, but he wasn't there. My nose told me he didn't exist, but my eyes told me he did. And there was all this energy around him. And he didn't like me in the beginning and ... and...I still get nervous when I think about it. But little by little we got used to each other. He proved he really cared about me when he helped save my life. I don't actually know. I think they'd be fun to chase, because I already love chasing squirrels. To be honest, I've never lived with a cat or had one for a friend. But I pretty much love everyone who's nice to me, so I guess I'd like having a cat for a playmate. Can you tell us a little about your adventures with Rory in Sketcher in the Rye? I fall in love in this book, and if you've ever been in love, you know how wonderful and trying that can be. I also find Rory and Zeke another dead human case to investigate. I sometimes wonder how they'd manage without me. I bet your human would be lost without you too. What kinds of mischief do you like to get into? Oh, all kinds. What's life without a little mischief? I like to dig holes even if I don't have a bone to bury. I love to chew on the occasional sock if it smells of someone I love. I especially like mischief that has to do with food. If someone leaves goodies where I can snag them, I don't waste a second worrying about the consequences of having myself a snack. I sure wish I had your ability to go wherever you want to go. Do you think you could teach me how to climb? There's a certain squirrel who always escapes up a tree before I can get him. I'd like to teach him it's not nice to tease dogs. Of course I'd never really hurt him. Hmmm...I wonder what squirrel tastes like? Any final words for your adoring public? Come visit sometime! I'd love to meet you and give you a big, slobbery dog kiss - as long as you're not a squirrel. And please don't forget to bring me something yummy. A steak would be appreciated. Someone shucked Harper’s accountant and left his body in the farm’s corn maze. 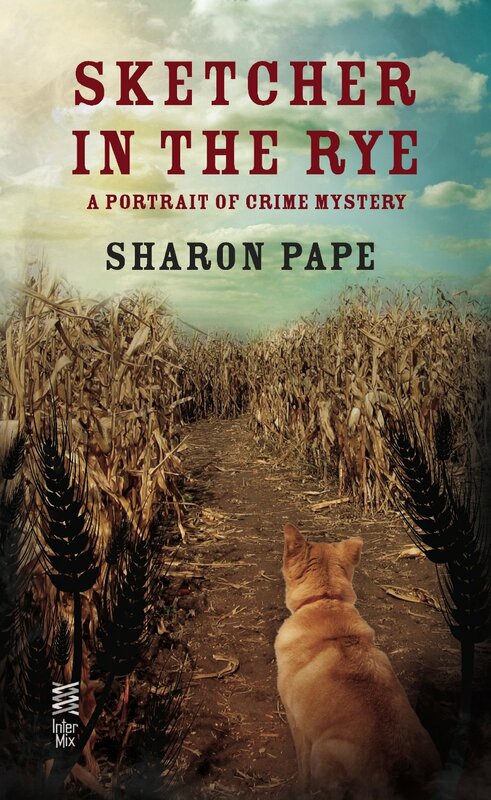 While Gil is quick to hire Rory to solve now not one but two crimes, the sketching sleuth isn’t so sure why the farmer wants her to focus her attention on his own family. Now I'm going to have the theme song from the Littlest Hobo stuck in my head for the rest of the day. Hey, Hobo. I can't blame you about sneaking treats...I do the same thing! Good job Truffles with the interview. I enjoyed meeting Hobo. I want to get to know Hobo and his crew better. Great interview Truffles! It was nice to meet you Hobo. I do hope to read about your adventures soon. Another great interview, Truffles. We always enjoy hearing from you. Nice interview, Truffles! Hobo sounds like a very nice woofie! veree nice two meet ewe hobo N a awesum interviews truffles...sorree ya hada reeeeely ruff start hobo, N we agree...squirrelz bee nuts !!!! say...any chance ewe like fish !!! this series is on my WishList!!! I cannot wait to start it!! I'm behind on this series and need to catch up. Nice review. Thanks for the giveaway chance.